Published in 2001 by Lothian Books (an imprint of Hachette Children’s Books specialising in Australian tales), this is an adventure story about three boys who find something gruesome in the wild. I was reminded a little of Stand By Me. This story is written from first person point of view, and the reader is therefore encouraged to identify with this voice. This is the voice of a younger brother, who tags along with his older brother and friend. Like the reader, the first-person narrator is an outsider. This makes it easy to identify with him. In the picture above, the narrator is shown trailing behind. The two older boys are together, both physically and emotionally. The younger boy is also a bookish boy, who writes of his love of storytelling. He loves that his teacher reads Robinson Crusoe aloud. This is the sort of character oft picked to be the narrator: Such lovers of everyday beauty are the best characters for picking out details. As you can see, the landscape is distinctively Australian, with the ochre pastels depicting local fauna. 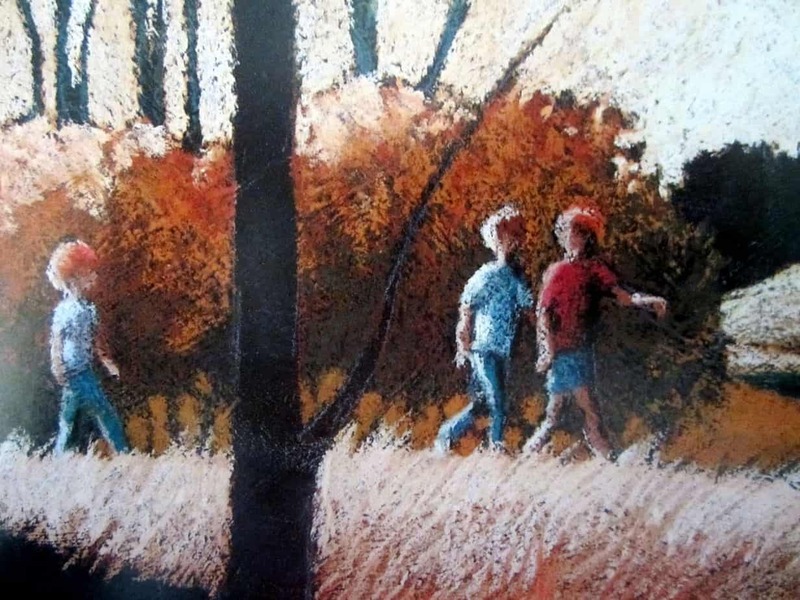 Pastel is a good choice for depicting characters who stand in for the ‘everyreader’. Pastel does not allow the depiction of fine details, so like the most rudimentary smiley face icon, these featureless faces could be anyone. They could even be you. There is also something eerie about a featureless face, and this book offers eerie in broad, Australian daylight. The strength of pastel as a medium is in its ability to render texture. The texture of the footpath looks beautiful on the page. 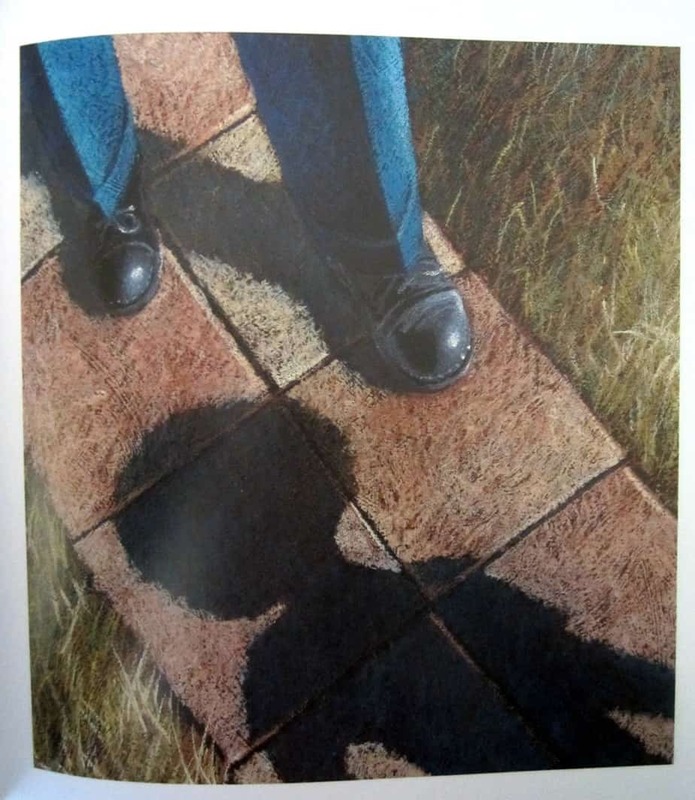 The picture of a boy’s shadow next to a police officer’s feet also gets around the problem that medium to close up shots would have — the boys’ faces are able to remain indistinct to the reader. There is big talk of the kind frequently seen in storybooks — the bigger boys tell the younger, more gullible boy made up tales about things they have seen floating down the river, including a hand waving from a caravan. The younger boy says it was probably The Queen, lending a little bit of humour, and this almost always has the effect of making a dark tale darker. And then all three boys get spooked after happening upon bones. The carcass looks ominously human. After alerting an uninterested policeman, they learn that these are dog bones. Although there is no human death in the world of this story, it is just distant enough to be a menace. In many stories for children, dogs are as human as the characters, so although the death is brushed off by the adult, the death of a dog is significant for a child. It is a death all the same. There is another small death, of sorts, at the end of the book when the younger boy sits by a window. Geoffrey and Bruce are no longer interested in playing with him much at the creek — they only go down to the creek if they can take girls. This is the death of childhood, seen first in the older boys, but which is inevitably coming for the younger one too. What about the crystal, found when the narrator went back to the creek to look for his mother’s lost hammer? The crystal makes a rainbow across his page, like the one he saw right before they found the dog bones. 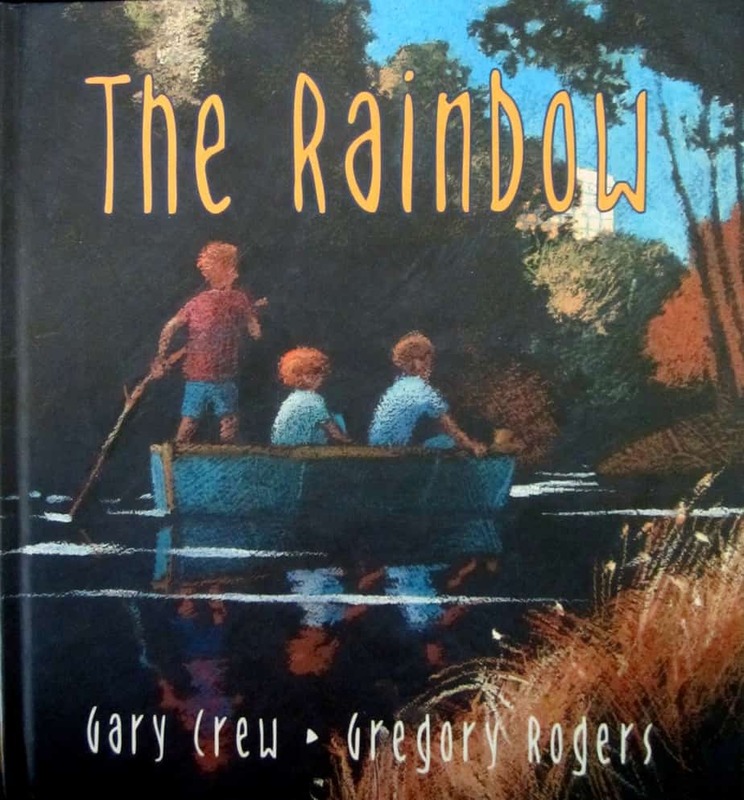 Rainbows can symbolise many things of course, but in this story I think that the intermittent appearance of rainbows symbolise those flashes and memories of childhood we get, even after the mystery and childlike wonder of the world has dissipated. Like the character in Chris Allburgh’s The Polar Express, this child narrator grows up, but manages to cling onto some of the beauty of boyhood.